While I agree with most of what you say here, I want to point out that the notion that "the vast majority are ethical human beings who take their responsibility and their duty seriously, and represent their organizations in the best possible way" is likely not to be particularly accurate, any more than it would be for the population at large. And I say that as someone who spent 2 years as an LEO. In my dealings with my fellow officers, I found that they were exactly the same as those we protected and served: Happy, sad, greedy, generous, ethical, selfish etc. The only consistent difference was a desire to be part of the force for a variety of reasons, some noble, some not, and the various agencies that they were part of had wildly differing abilities to weed out unsuitables. So you are RIGHT to be nervous when confronted with a cop: you have no idea who they are, how they are trained, what they will see as a threat. This unpredictability is frightening to me. I appreciate your insight. 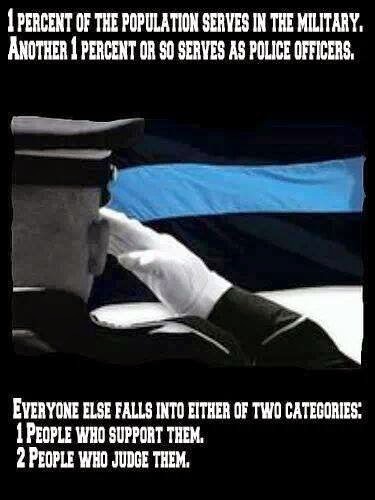 I can certainly appreciate the point of view that our military and law enforcement officers are a microcosm of our our society. This isn't Lake Woebegone, after all. I guess I'd like to be optimistic about the whole thing. The men and women I served with in the Navy weren't always pillars of the community, but they weren't evil. They had a desire to serve, regardless of the motivating factors, and I like to hope that provided a level of professionalism that might otherwise be missing from a more mundane career choice. I guess the issue for me is watching how men and women change in the position of authority. People who are pillars of teh community at home, wonderful with kids and generous with their time, suddenly turn into grumpy, hair-triggered meanies. Not evil, no. Professional? Mostly, but from their POV. Reading Jim Wright has given me insight into how a navy man sees his work. I imagine, from reading your interactions at SKS, that you feel much the same, as do the other NCO's and enlisted who comment over there. But that POV, the way of an armed force, is different than that of civilians, yes? So it is here. The first rule of policing is, Get Home For Dinner. Not, Serve and Protect. Is that a change from earlier years? I think so. It certainly colors my interactions now. And it definitely is different from how I believe the police should act. Anyway, As I said, I agree with most of your original post, so I'm just picking nits here. Thanks for letting me muddle around.